What Is So Special about the Luxury Condominium, Jade Ocean? Why Should You Consider Buying a Condo in Jade Ocean Sunny Isles? The new, modern, luxury condominiums around the world nowadays, offer some of the most elaborate features, services, and amenities. Most valuable condominiums are located directly on the ocean and offer private beaches, often with private restaurants, as well as other services. These are often most attractive modern structures as well as technologically and architecturally sound structures. Today, Miami offers some of the best new condominiums in the world and one of the most popular new-construction condos site is in the very well-known Sunny Isles Beach area. This area was built in a very short period of time, basically in the new millennia. Today, Sunny Isles Beach is also known as “the billionaire’s row” because so many high-end condos are here. Some of the best known brand-names in condo construction are here, such as Armani, Jade, Regalia, Trump, Turnberry and more. One of the most eye-catching structures in Sunny Isles Beach is condominium, Jade Ocean. Carlos Ott, who is known to be one of the best architects in the world, has designed this majestic condominium. The aesthetic design of this condominium is one of its most notable features that has made it a favorite of the condo buyers. Jade Ocean Sunny Isles is 51-floors high and the total number of units this condominium offers is 256. The spectacular appearance, and the extraordinary exterior and interior design and décor of this great tower, earn the appreciation of every visitor. The fantastic location of this condominium is one of its main features. Downtown Miami, Fort Lauderdale, and all the important areas around the Sunny Isles Beach are easily reachable from this location, making this condominium an excellent option for the condo buyers. 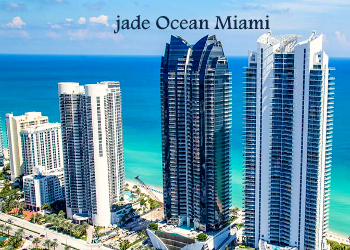 Jade Ocean, Miami, is one of the most beautiful luxury properties in the Sunny Isles area, and the property’s value is going to rise more in the future, and thus, it can be a very profitable investment property. If you are looking for a luxury residence in the Sunny Isles area, then you should consider buying a condo in this lavish condominium. The residential features of this condominium are outstanding and are worth mentioning. Smart home technology is available in each unit, providing a futuristic lifestyle to the residents. The building is surrounded by beautiful infinity-edge pools. The gorgeous three-story lobby impresses every visitor with its rich décor. The residents can enjoy at the private beach club and get refreshed at the cafes and cabanas. There is a splash deck for the children to have some fun. Covered parking areas, car wash, and full-time valet services are available as well. Security services are very impressive, and round the clock concierge services are also available. The units come with a large number of luxury features and amenities. They have large floor to ceiling glass windows; spacious walk-in closets, providing enough space for keeping clothes and accessories; extra-large terraces offering spectacular views of the Atlantic and the lovely beach. The kitchens are decorated with glass cabinets, Sub-Zero kitchen appliances, granite countertops, etc. The bathrooms have beautiful faucets and fixtures designed by European designers, luxury bathtubs, marble flooring, etc. And many more luxury amenities are available in this magnificent condominium. If you are interested in buying a condo in this condominium, you should consult a professional real estate agent who specializes in Jade Ocean Sunny Isles. For more information about this condominium, or to contact a Jade Ocean specialist please call Lana Bell with One Sotheby’s International Realty at (305) 336-0457 or visit our website.